Impeccable grooming is one of the numerous reasons why Okemo Ski Area in Ludlow, Vermont, has continued to thrive. Through the ingenuity of powerful snowmaking machines and all-night grooming that churns ice into a skiable surface, skiers and boarders are able to ply their trade. Novice skiers feel like Olympic downhill champions as they cruise the long boulevards. Last season, Okemo attracted more than 500,000 skiers, making it the third-most popular ski area in New England. The majority of skiers are families, who return year after year, originally lured to this 3,344-foot peak when all they had was a system of pomas (tow rope-like devices that you stick between your legs to pull you up the mountain) and narrow trails. Thankfully, when Diane and Tim Mueller took over as owners of the resort in 1982, they replaced the rest of the pomas with high-speed lifts that intricately link this broad-shouldered peak. In 2003, seven additional trails on adjacent Jackson Gore were opened, appealing to the more advanced skiers, who congregate on narrow, gladed trails like Quantum Leap or Vortex. This was the first phase of a major expansion Okemo has undergone this past decade. 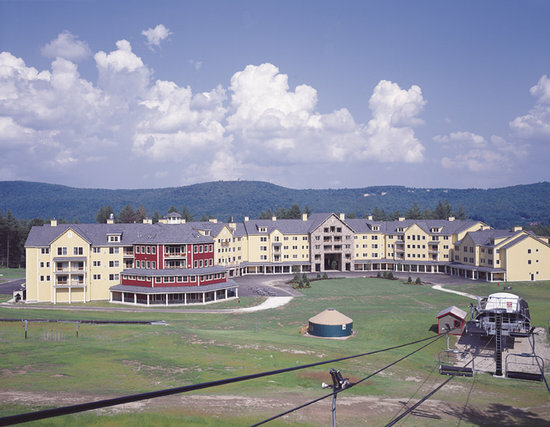 The expansion also included a new fitness area, skating rink and slopeside hotel called the Jackson Gore Inn. The Muellers spent more than $50 million to create the 177-room ski-in, ski-out resort, one of the finest lodgings in New England, for folks who like to be at the base of the mountain. 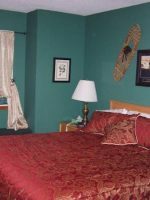 Steps from the high-speed quad that will get you up on the mountain, the Jackson Gore Inn has a spacious, comfortable feel with soft indigenous-wood paneling, carpeted floors and expansive windows for you to peer up at the mountain. The large fireplace in the center of the lobby always seems to be roaring with staff, on hand to toss in log after log. Parents will be happy about the heated underground parking garage, valet parking and ski storage. Rooms range from one- to three-bedroom suites and also have a homey feel. Most have full kitchen facilities with stoves, dishes and refrigerators. The rooms are like condos with loads of closet space for all that ski gear, a fireplace and large bathrooms with showers and tubs. We chose the Executive Room, which comes with a king-size bed and pull-out sleeper, perfect for our family of four. However, if you want more space, ask about the latest additions to the Jackson Gore area -- the Adams and Bixby Houses. Both of the houses are a little bit removed from the hotel, so they offer a peaceful retreat. They have larger bedrooms than the suites in the hotel, and each is equipped with its own outdoor hot tub, washer and dryer. All rooms have flat-screen televisions, DVD players and Wi-Fi access. The best part is that Children 12 and younger stay at the Inn for no extra charge. Stayed here on a Sunday/Monday night to do some spring skiing. At end of ski season resort was very quiet, hours for some of the food service and other things were modified. I could see this place being a bit of a zoo in full season as it definitely includes time share owners which always makes a place a little crazier. That being said if you want to ski okemo the location can’t be beat. Ski in/ski out. Easy to go back to your room if you have a kitchen and eat lunch. You seriously could do that and keep your ski boots on. Parking and mandatory free ski valet are great as well. If you want to get in a ton of skiing and minimize time to/from the mountain this is a great option. The suite and the hotel room were both very comfortable. The Inn is very well laid out. 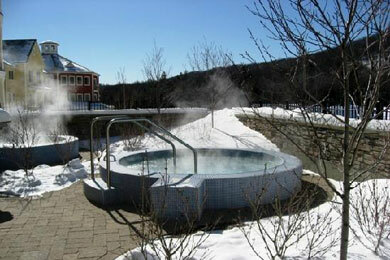 You can walk from your room to a spa and indoor and outdoor heated swimming pool and both indoor and outdoor hot tubs. Very relaxing after a day of skiing. You can bring your own ski equipment or rent it on site and walk from the Inn a hundred feet or so and get on a ski lift. Very competent ski instructors are available. The Inn includes a good cafeteria which is open for breakfast and lunch and a very nice restaurant. The In operated year round and summer and fall activities include scenic rides on the chair lifts. In winter, it's all about the skiing and the apres-ski activities. The Penguin Playground Day Care Center, located at both Jackson Gore and Okemo base areas, caters to children, ages 6 months to 4 years. Kids will have fun doing arts and crafts, singing, storytelling and drawing. 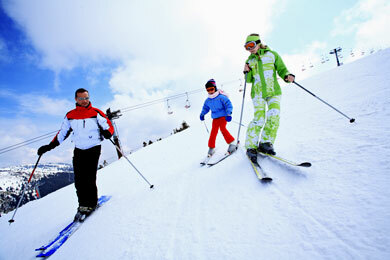 As young as 2 years old, children can take half-hour private lessons with a ski instructor in a Star Booster sessions. Mini Stars, ages 3 to 4, go out with instructors in small groups for 1.5-hour lessons. The Super Mini Stars group is for children, ages 3 to 4, who already have experience on the slopes. Keep in mind that the staff at the Penguin Playground Day Care Center can transport kids to the Mini Stars lessons but not to the private lessons at Star Booster. Snow Stars, for children ages 4 to 7, have the option to go with ski instructors for half-day sessions (10 to 1:30) or full-day sessions (10 to 3:30) that include lunch. The same holds true for Mountain Explorers, ages 7 to 14. Whether your family skis or snowboards, there are a slew of trails, a halfpipe and terrain park to keep everyone occupied. Get the most out of a sunny day by starting your morning at Jackson Gore and ending on the South Face trails of Dream Weaver and Rim Rock. To get the body working, a high-speed quad leaves you at the summit of Jackson, where you can choose Upper Limelight, an advanced trail that snakes through the tall spruces and birches that carpet the hillside. During the course of the day, gradually make your way across the mountain on a series of blue cruisers like Upper and Lower Arrow and Lower Chief. There are a few steep pitches here and there, but mostly the terrain is a steady downhill, making you feel like the next Bode Miller as you carve those turns. Unlike nearby Killington and its seven peaks, you can pretty much ski the entirety of Okemo in a day and get a feel for which of the trails you'd like to try again the next day. Dream Weaver tops the list of favorites for many. With spectacular views of Ludlow and the valley below, the trail is on the edge of the mountain, rolling up and down the terrain on a rollercoaster-like ride that always seems to test your mettle late in the afternoon. The after-ski scene at Okemo also thrives. Many families head straight to the fire pit to unlatch those boots and warm up. Nearby is the Snow Fun Playground, where kids climb up and slide down the snow structures. Older children, at least 42 inches tall, will want to cruise down one of the four lanes at the snow-tubing park. It's located just off the magic carpet in the Jackson Gore courtyard. Want more? The Ice House is Okemo's skating rink. Rent skates, do some figure-eights, and then relax by the gas-fueled fireplace. The Spring House is Jackson Gore Inn's fitness and pool area. There are hot tubs, a children's pool with waterslide, an adult pool to swim laps, saunas, racquetball rooms that double as walleyball (volleyball with walls) rooms, a workout facility with weights and aerobic equipment and daily yoga and Pilates classes. The Jackson Gore Inn also offers a heated outdoor pool and hot tubs, in case you want to hear the groomers working their magic on the mountain. After showers, everyone huddles in the cozy chairs of the lobby for a pint or a s'mores kit to make the sticky marshmallow, graham cracker and chocolate concoction at your table. There's also usually some talent on hand, drawing caricatures of the kids or performing magic. Don't forget that Okemo is a four-season resort. 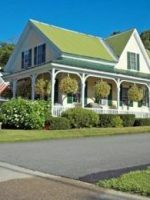 Go there in the spring, summer or fall, and the prices at the Jackson Gore Inn are greatly reduced. That skating rink at the Ice House is now tennis courts and a running track. Less than a mile away is the Okemo Valley Golf Club, nestled in the valley below the mountains. Okemo is just off Route 100, one of the most exquisite stretches of road in the country -- a bucolic blend of rolling hills, farmland so fertile you feel like jumping out of the car and digging your hands in the soil, covered bridges and the ubiquitous Vermont white steeple. So, not surprisingly, Ludlow and the maze of roads that loop around Okemo Mountain are some of the best road-biking spots in the state. The first night at Jackson Gore Inn, we dined at Coleman Brook Tavern, just off the lobby bar. The kids grabbed yummy nachos and fish and chips, while mom and dad dug into the baked brie, a Caesar salad, and sesame-encrusted ahi tuna. Prices were reasonable, with the ahi tuna costing $25, and everyone was pleasantly surprised. For breakfast, it's hard to top The Hatchery on Main Street in Ludlow. The place is always crowded on weekend mornings, but they know people want to eat and ski, so you'll be seated quicker than you think. The omelets are excellent, especially if you combine the eggs with Vermont cheddar. 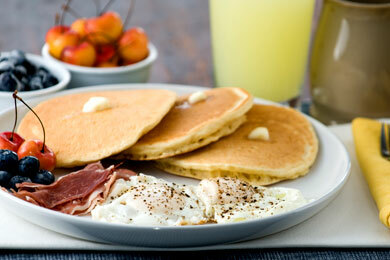 The pancakes, bacon and sausage also will get you energized to start the day. Lunch on the mountain is always at the Roundhouse, a large, circular room at the end of the Jackson Gore Inn. Sure, they have your typical ski lodge fare like chile and burgers, but they also offer more health-conscious food like Vermont cobb salad, chicken Caesar wraps and fresh tomato, mozzarella and proscuitto. Above Roundhouse was our kids' favorite restaurant, Siena, which serves Italian food. On the menu are pastas, ravioli, chicken and veal parmesan, as well as a seafood dish of scallops and clams in a white wine sauce over capellini. 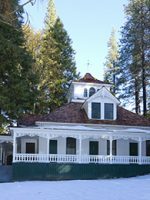 Rooms start at $175 a night in winter. The Executive Rooms are a little bit more at $200 a night. Ski and snowboard rentals are located right at the Jackson Gore base. If you want to save time, you can download the form from the Okemo Mountain Resort Rental Center. That way, you won't have to fill it out in the morning, when you're frantically trying to rent skies, drop the kids off at ski school (also located nearby) and get to your own lesson. With rentals and the ski school located next to the hotel at the base, it doesn't get much easier for a family to ski. 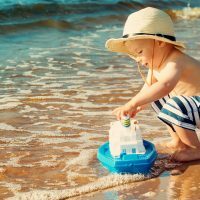 Jackson Gore Inn goes overboard to make sure the children are having fun. One early evening after skiing, we came downstairs to have s'mores at the Coleman bar in the lobby, and there was an artist next to the fireplace, creating caricatures of the kids. There's also a small video arcade, so the kids ran off after dinner at the Coleman Brook Tavern, while my wife and I sipped our wine in peace. The busiest and, thus, most expensive times of year to visit the resort are during Christmas, New Year's Eve, Martin Luther King weekend and February and March. If you can go in the winter before Christmas or after spring break, the price for a room is less, and there will be far fewer people on the slopes. Rooms are even cheaper when the warm weather arrives, and you can pick wildflowers on the hillside in relative solitude. From points South, take I-91 North to Exit 6 and Route 103 North. Stay on Route 103 North for 24 miles to Ludlow. 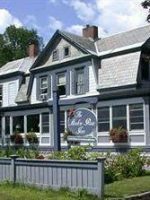 Continue 1.5 miles past the Okemo Mountain Resort, and you'll find the Jackson Gore Inn entrance on your left. From Boston, take Route 2 West to I-91 North, and continue with the directions above. On the return trip, you may want to go slightly out of your way to stop at the Vermont Country Store in nearby Weston. Their vast selection of candy, chocolates, soda and cheeses makes for perfect souvenirs for the drive home. We love it when resorts schedule kids' programs to coincide with special offerings for mom and dad. Every Saturday night at Jackson Gore Inn is Kids' Night Out for kids, ages 6 months to 12 years. The same staff that run the Penguin Playground Day Care chaperone the kids for a night of movies, pizza and more. The older children will have the chance to swim and skate with counselors. That leaves mom and dad the chance to sign up for the Snow Cat Dinner. An all-terrain snow cat, your own private carriage in the snow, picks you up at the inn and escorts you up the mountain to Epic, Okemo's mountainside restaurant, which is normally open only for lunch. You'll dine on a five-course, candlelit dinner next to the fireplace. Seating is limited, so make sure to reserve in advance for this romantic outing.